What is Better Than Bacon? While my instinct says that there is nothing at all, I have recently come across something that makes me want to revise my answer. 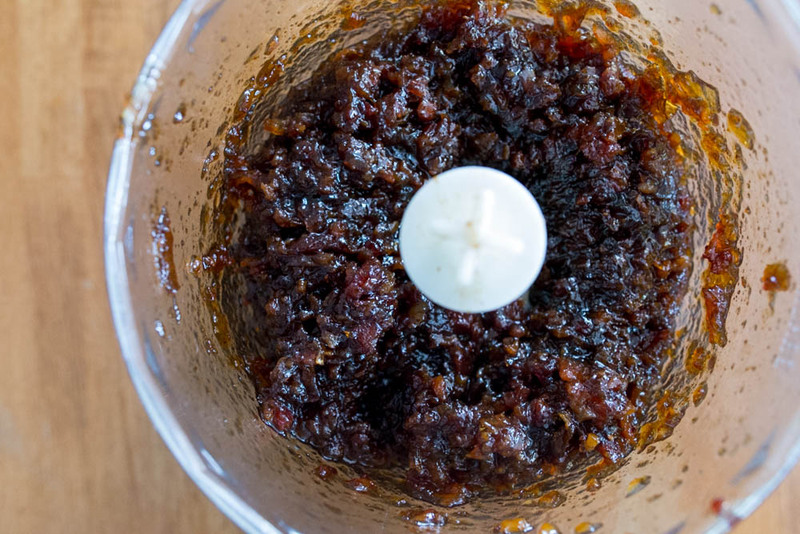 Have you had bacon jam? 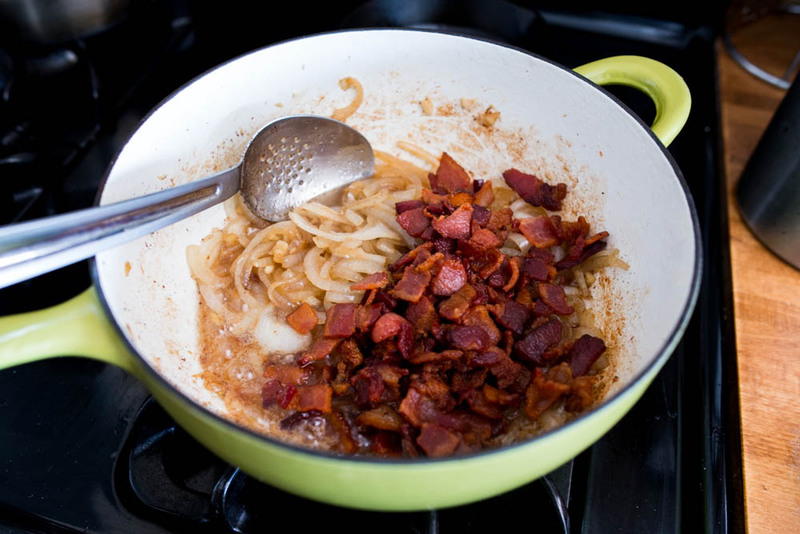 The beloved bacon is transformed slowly into a savory smokey jam. One bite and you will now be thinking about all kinds of ways to enjoy the spreadable bacon. 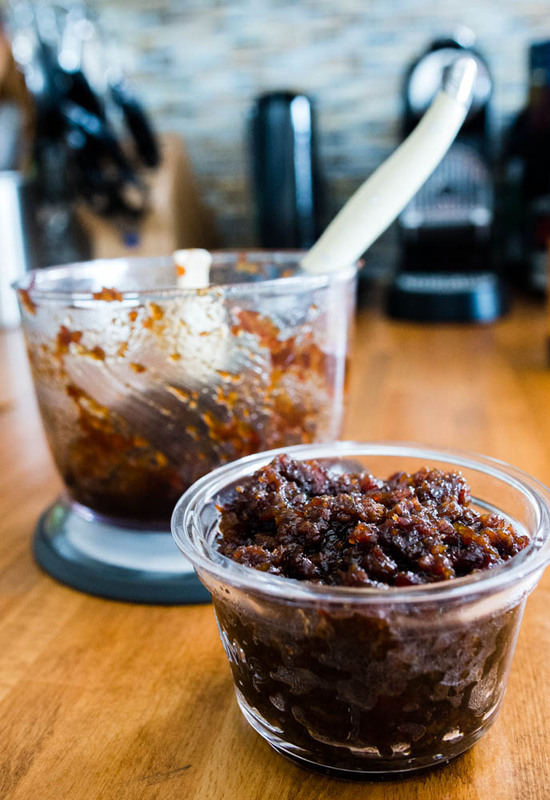 Is straight out of the jar with a spoon a tad too déclassé or is all forgiven when it comes to bacon jam? A little bit of Googling and I turned up a myriad variations of the recipe. Clearly I am a little behind the trend on this! 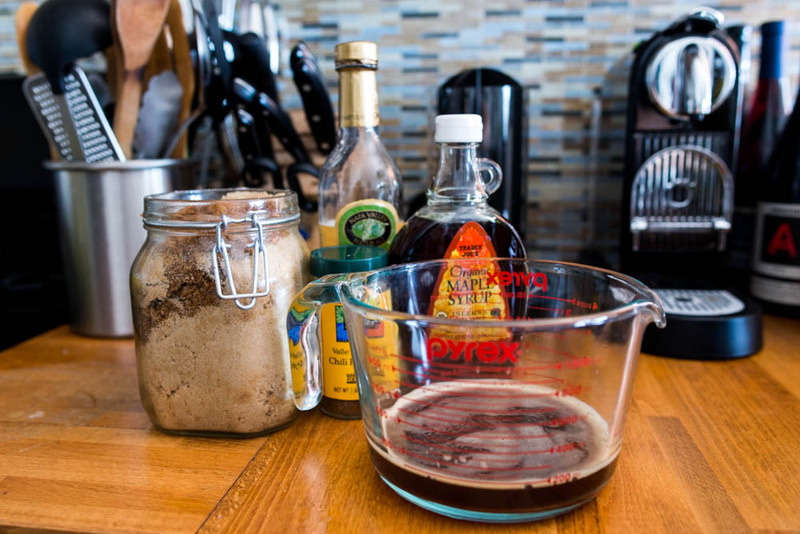 After browsing around, I settled on a recipe from America’s Test Kitchens. This particuplar one was easy enough and started off with a good pound of the star ingredient, good old quality bacon, roughly cut and into a heavy duty pot. A good 20 minutes and roomful of enticing bacon scent later, I strained out the now golden brown bacon bites. I tried but could not resist sneaking a few bites of the crispy pieces – cook’s privilege. While the bacon was browning, I busied myself by measuring out the liquid ingredients. Even though coffee might seem a strange choice, it really did contribute to the complex flavors of the end result. Trust me. 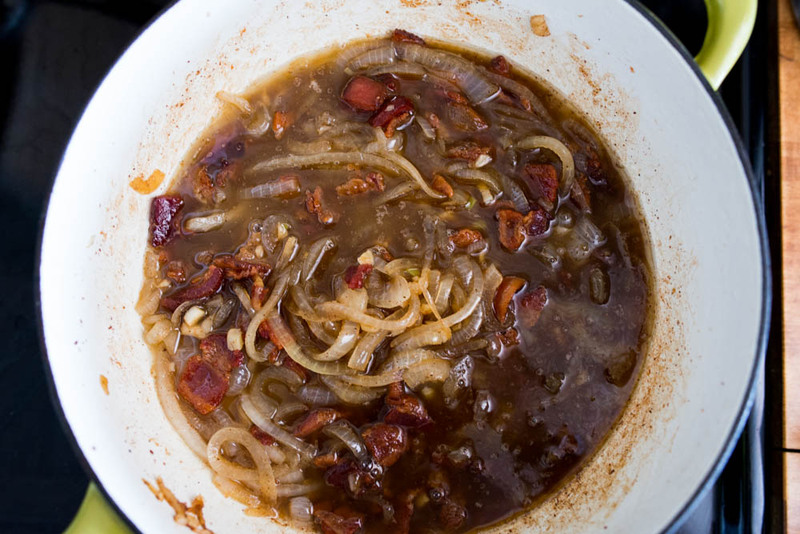 Using the same pot, I sauteed the mound of thin onion slices until they were soft and slid the bacon back into the pot and added the liquids. Now this was the hardest part, letting the mixture simmer on a low heat for 1 1/2 hours. Yes, that’s right, 90 whole minutes where I couldn’t do anything but take a peek once in a while and stir to make sure that nothing stuck to the bottom and burned. Finally, the bacon and onion mixture had cooked down to a dark amber brown color that glistened beautifully. The onions had almost all but disappeared, leaving a translucent version behind, coated in a bacon and honey like sauce. A quick whirl in the food processor and the jam was ready! I couldn’t help myself but sneak a few bites before putting the sweet spread into a glass jar. Kept in the fridge, this can last up to 2 weeks or up to an entire month in the freezer. Just remember to warm it up a little bit before enjoying them spread on top of a fluffy buttery biscuit. 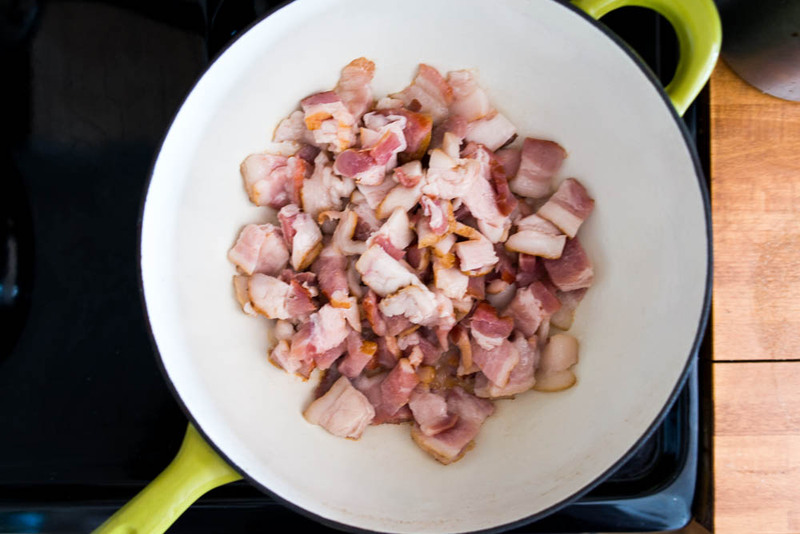 Add bacon to large Dutch oven and cook over medium-high heat, stirring occasionally, until crisp, about 20 minutes. 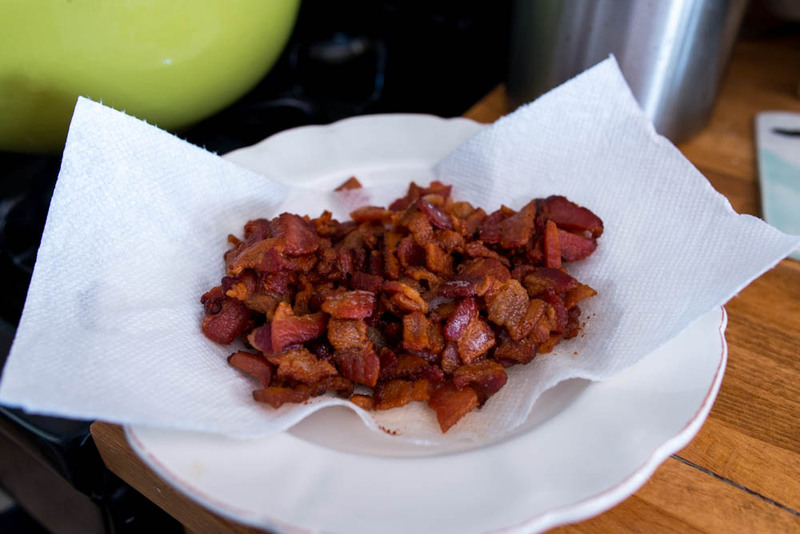 Using slotted spoon, transfer bacon to paper towel-lined plate, leaving rendered fat in pot. Return pot to medium heat, add onion and garlic, and cook, stirring occasionally, until onion is translucent, about 10 minutes. 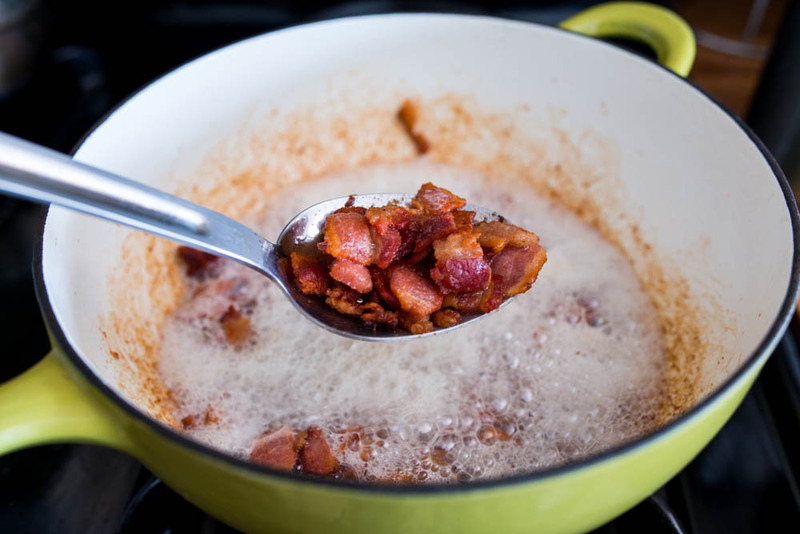 Return bacon to pot, and stir in coffee, water, vinegar, maple syrup, sugar, honey, allspice, and chili powder. 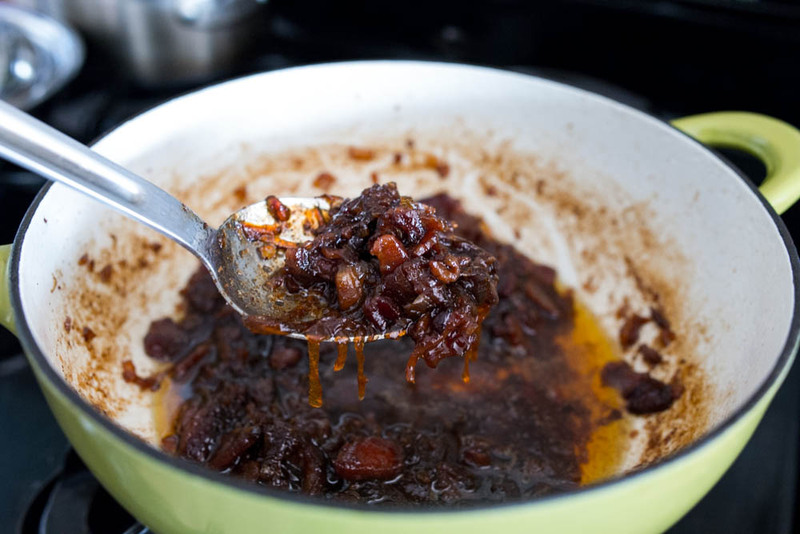 Bring to simmer and cook, stirring occasionally to prevent scorching, until mixture achieves jammy consistency, about 1 ½ hours.